I have two quick announcements today. First, thank you so much for the support in winning The Best Craftsy Instructor Blog! I am so honored. There was some stiff competition and I appreciate you taking the time to vote. Click here to see all of the winners in all categories! Secondly, I will be teaching two workshops at Vogue Knitting Live in Chicago this weekend, Sunday, Nov. 3rd. In between my classes I am going to be signing books in Jaala Spiro's Knit Circus booth in the market. After my class I will get to the Knit Circus booth #213 as soon as possible, a little after noon. I will be there for an hour to sign and chat. I will have the trunk show for my latest book, Topsy-Turvy Inside-Out Knit Toys. I hope you can stop by and say hello, get your book signed or purchase a book from Jaala to have signed (she has my new and older books available for purchase!). I hope to see you in class or at my book signing in the Knit Circus booth #213. 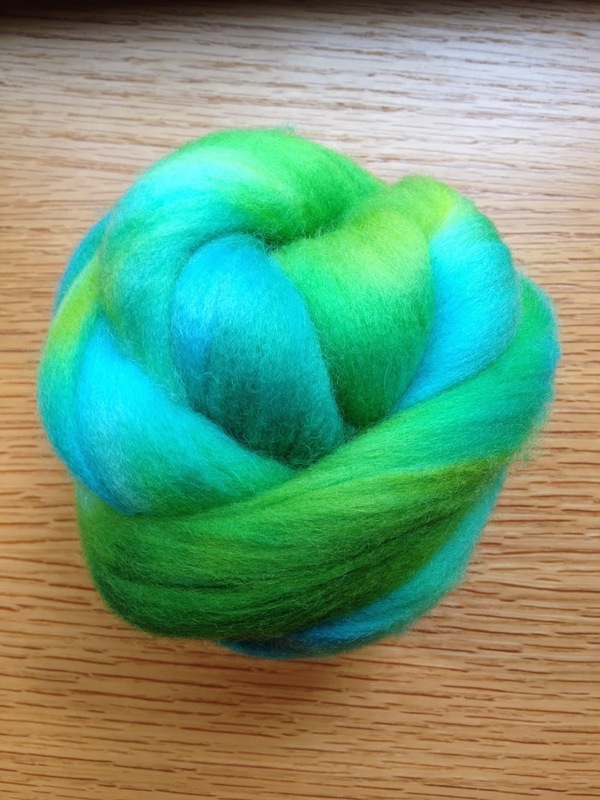 Plus, Jaala makes the coolest yarns dyed right here in Madison. You have to see them to believe them. Click here for Vogue Knitting Live Chicago information! This weekend coming up! Click here for KnitCircus website! Click here for the KnitCircus Yarns on Etsy! Click here to see the Topsy-Turvy Inside Out Knit Toys book trailer (these toys will be in the booth)! 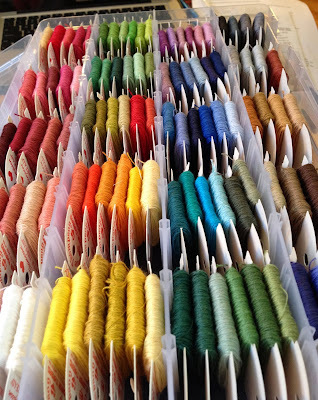 I am teaching all 3 teaching days filled with various workshops at Vogue Knitting Live NYC, January 17-19th, 2014! Please check all of the classes out and sign up as the NYC VKLive has been known to completely sell out of class space! Get in early if you are thinking about going to this fun event and I hope to see you there. Now for the business of the day. As promised, I cast on the Peerie Flooers Hat by Kate Davies, which means "little flowers" in the Shetland dialect. I love this hat and the pattern is wonderful. Through the years I have collected a box of 2-ply wools of various brands and colors like Jamieson 2-ply, Harrisville Shetland, and Knit Picks Palette. I have found that these wools intermix very nicely. My version of Peerie Flooers (above) will be a combination of Harrisville Shetland and Knit Picks 2-ply wools. I suggest that if you enjoy colorwork like I do, that you start a collection of these small 50 gram balls. Then when you see something you want to knit like colorwork socks, hats, mittens, etc., you can reach for your 2-ply wool collection and go to town. You need such small amounts of any one color that one small ball of wool goes a long way. Also, see those ends hanging out waiting to be woven in? I don't mind that one bit. I kind of like weaving in ends.... I know, weird but true. Mary Jane Mucklestone's Solidago Socks are the perfect example of grabbing some 2-ply out of the stash and going to town. This sock has Jamieson and Palette. 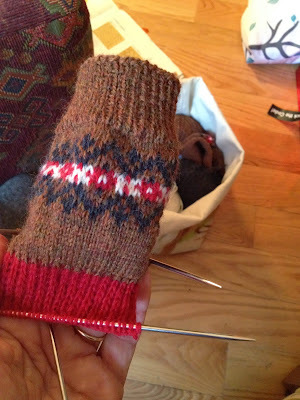 I am now almost to the toe on the second sock, a new pair is almost done. This is a great free pattern from Knitty.com. 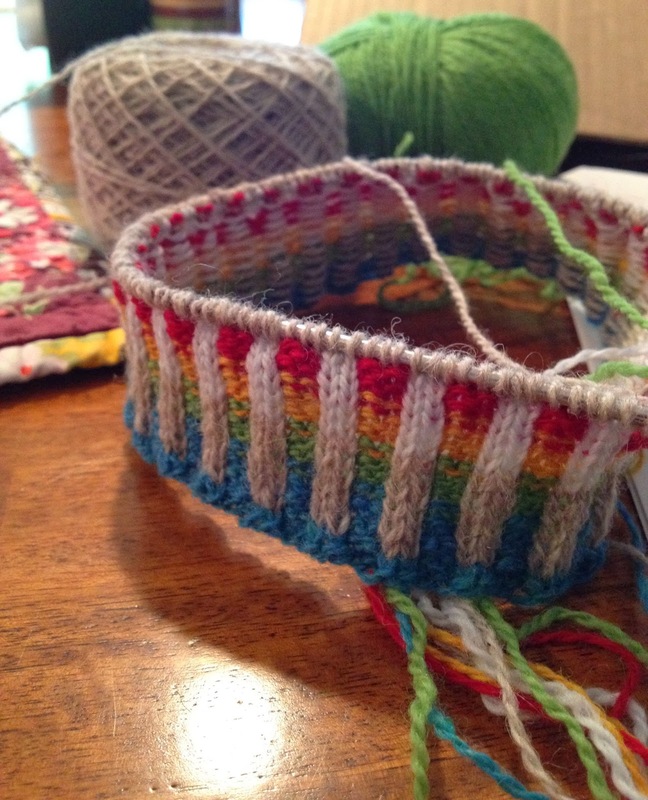 Solidago would be a great first-time colorwork project for new two-color stranded knitters. The colorwork section is so small that you can get your feet wet and accomplish something with quick success. 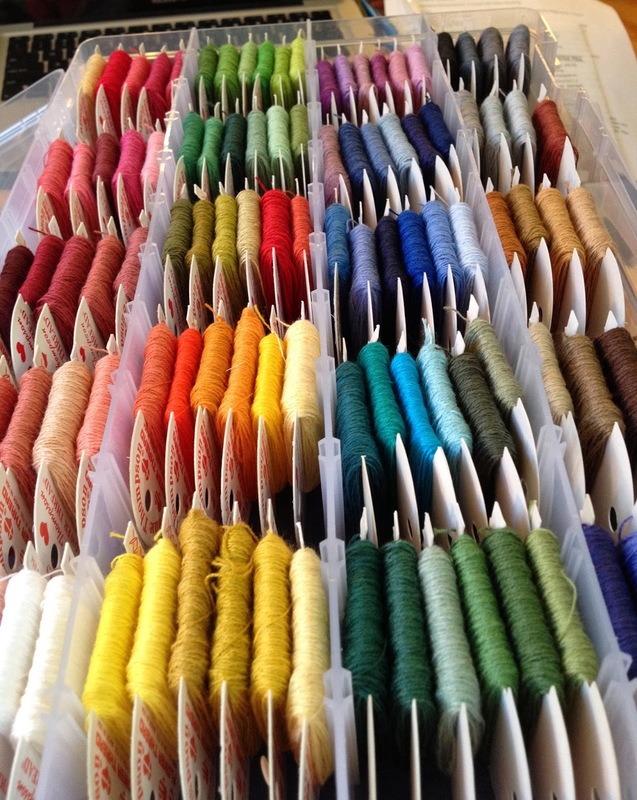 I am really excited about my box of embroidery thread from Flower Thread. I've had it for quite some time now but I hadn't shared it yet. Last summer when I was deeply entrenched in embroidery, I had heard my embroidery idol, Rebecca Ringquist, talk about loving her Flower Thread. Enough said. I am still embroidering here and there, I'll share some of it soon. My work knitting has definitely taken over though. Click here for Rebecca's excellent online classes on Creativebug! Flower Thread comes like this, people! Wound and sorted and inspiring! Click here to see more about Flower Thread! I have pulled my Patchwork Socks (my favorite socks ever) out of the sock drawer to enjoy again this fall. Switch yarns every 10 rows, use up your left overs. More socks like this to come. That's all. Friends in Fiber Falkland, 4 oz. ~ great prices! This is one 2 oz. bobbin. Double-Marl. I'll show you the finished handpsun yarn soon, it's plied and drying now. 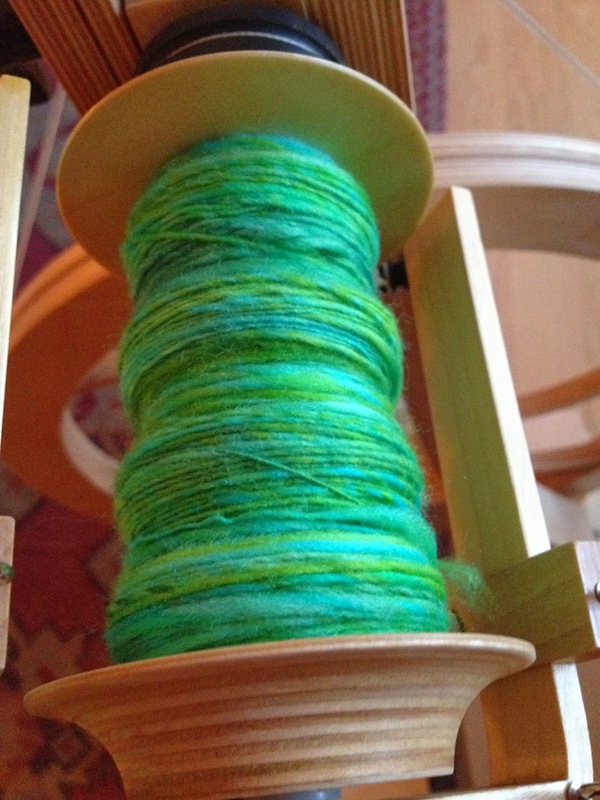 Check out this braid that is next up on the wheel! It is fall goodness in wool. 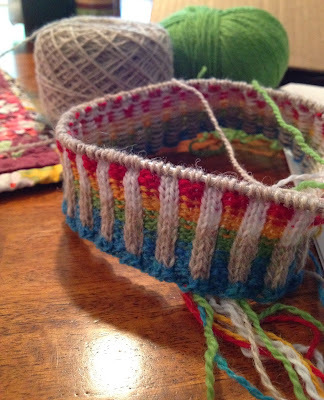 I am making this free colorwork hat pattern from Shibui! This is a good unisex hat. I am making these Snowfling Mittens very soon! I will be reviewing Made in America Yarns coming up with a yarn giveaway! I have a stack of books a mile high set to review and giveaway... I can't keep up with all of the cool knitting books out there, like this one, and this one, and this one. Look for these soon. There are many more I listen to and I will list more in another post. These are not in any specific order. These audio and video podcasts keep me company while I do my knitting work and running and hiking. Thank you to all of these amazing podcasters who add so much to our knitting community. Well, that's enough for you today! I finished a pair of Snowfling mittens earlier this year. They are lovely, especially with an MCN lining. Enjoy. I love it when you show off your hand knit socks. I love your blog. It's bright, colorful, always inspiring in one way or another... I love the photos, the way you make it look so easy... I agree with Julie, you should podcast! Speaking of podcasts, thank you for listing what you listen to. I was listening to Cast On, but with all she has had going on in her life, her podcasts do not come often enough for me. Totally understandable, but I could use another. I love youshoes, can you tell me what brand they are? Your blog is one of my favorites and I'm always so excited and inspired to see what you are working on, so I am all honored and humble and stuff to be keeping you company while you knit. Thanks for the shout out! Kathleen, the shoes are wool birkenstocks in the bern style. No, please, I like to have everything she says in writing, so I can easily go back and find a certain point. Podcasts are useless for me. I won't take the time to listen to them. Great list of podcasts! I just spend the weekend with the Stockinette Zombies. Glad to see them on your list! Have fun at VK Live. I'm sure your classes will be fabulous!